Shortly after Thanksgiving last year, Ron Cobbley woke up with a stiff neck. Ibuprofen did nothing to help the South Jordan, Utah, resident. Soon the pain became so intense that Cobbley headed for the emergency room at Intermountain Healthcare's Riverton Hospital. Several MRIs and CT scans later, Cobbley's doctors noticed a staph infection nestled where his collarbone meets his sternum. The doctors ordered surgery. While recovering, Cobbley, 74, turned on his hospital room's high-definition television, outfitted with a zoom camera, speakers and microphones, to meet with Dr. Todd Vento, Intermountain's medical director of infectious diseases telehealth services. Intermountain Healthcare intensivist Dr. Terry Clemmer (seen on the screen) uses telehealth technology to consult with on-site nurse Michelle Rosqvist about care for an ICU patient at LDS Hospital in Salt Lake City. 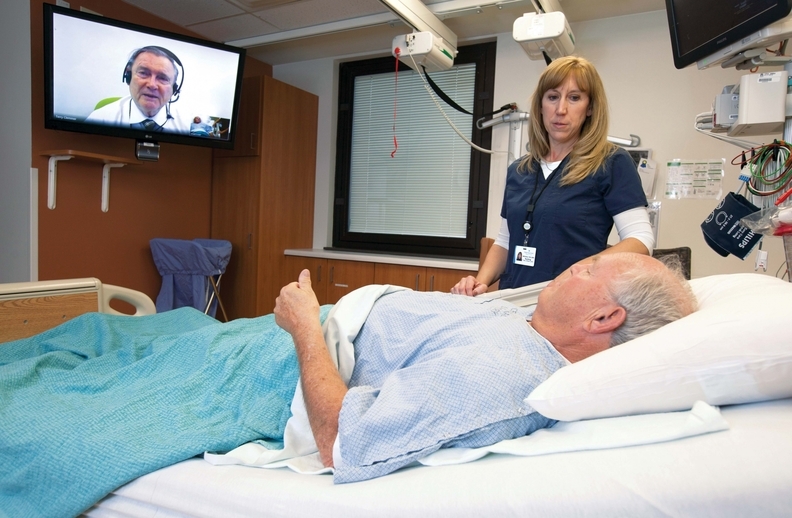 Telehealth is moving beyond easier access for low-acuity patients. Leading health systems are using the technology for more-complex cases in remote locations. Vento conducted the post-operative evaluation from his office at the system's Intermountain Medical Center in Murray, Utah, its flagship campus. He examined Cobbley's incisions and spoke with the local care team to discuss medications. “It was kind of space age,” Cobbley recalled. 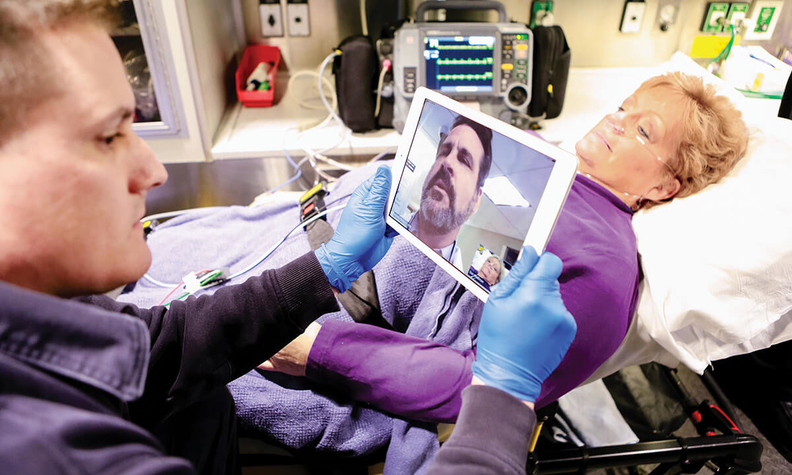 Intermountain, whose telehealth system is among the most advanced in the country, is using the technology to extend its specialists' skills into the smaller community hospitals and rural locations in its network. These medical outposts rarely have the clinical expertise necessary to handle the more-complex cases that come through their front doors. 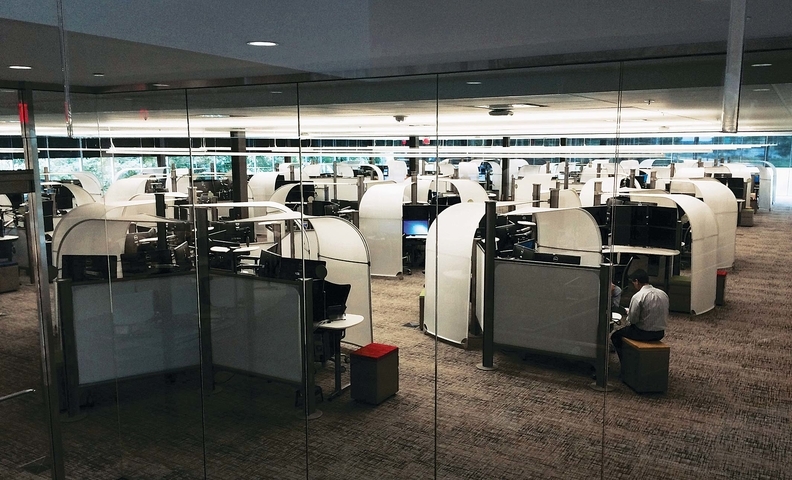 The system has installed videoconferencing setups in 1,000 rooms across its 22 hospitals. Intermountain's 35 telemedicine programs include specialists providing consultations on stroke, newborn critical care, behavioral health, wound care and cancer care. Intermountain is also using remote monitoring for chronic disease patients with conditions such as hypertension and heart failure. Instead of hiring 22 infectious disease doctors to staff each location, telehealth “enables the local team to manage those high-acuity patients,” said Brian Wayling, Intermountain's assistant vice president of telehealth services. That saves Intermountain money and allows the patient to stay in the local community. For more than a decade, some hospitals and health systems have turned to telehealth to reach patients in areas squeezed by physician shortages. More recently, providers answered patients' calls for convenience by offering on-demand video visits for routine health problems. Now the leading health systems are harnessing telehealth to treat patients with more complex conditions in ways that lower costs by preventing complications, reducing lengths of stay and, when used in home or post-acute settings, reducing readmissions. That's becoming essential as the U.S. healthcare system moves toward paying physicians for value instead of the quantity of care. Providers taking part in accountable care organizations and bundled payments now must look for ways to deliver care more efficiently. Telehealth has emerged as an important tool in that effort. “The beauty of telehealth is you can better manage people and populations,” said Frances Dare, managing director in consulting firm Accenture's health strategy practice. Much like Intermountain, San Francisco-based Dignity Health launched its telemedicine network to broaden the reach of its highly trained specialists' skills to smaller community hospitals. 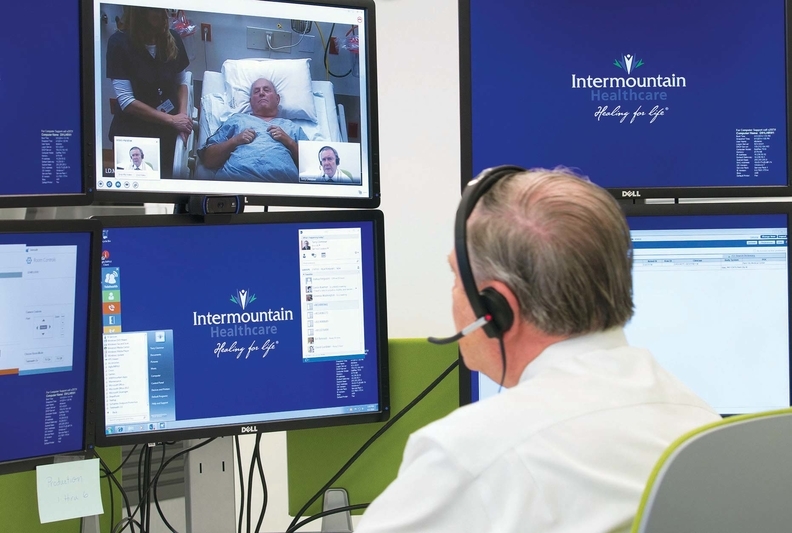 Intermountain has installed videoconferencing setups in 1,000 rooms across its 22 hospitals. Not all of these community hospitals are in rural areas. There just simply aren't enough specialists to meet patient demand, explained Dr. Alan Shatzel, a neurologist and medical director of the Dignity Health Telemedicine Network. But telehealth “allows you to kind of compress time and space and use that core group of expertise across a broad network of hospitals,” he said. Dignity started out with emergency stroke evaluations in 2008 and has since expanded its use of telehealth for critical care, mental health, disease management and other services across 45 hospitals and clinics. The network had 20,500 telemedicine encounters with patients in 2016. Patients in New York, Pennsylvania and beyond have to fight their way into Manhattan to see physicians at the New York-Presbyterian health system. So last year, the system, which is affiliated with Columbia University Medical Center and Weill Cornell Medical College, launched its telemedicine program to reach more people. It's all about delivering care more efficiently, said Daniel Barchi, the system's chief information officer. “If we can create an environment where a virtual visit allows that doctor to see many patients in a really efficient model, that's the ultimate goal,” he said. The system so far is seeing the biggest impact from its telepsychiatry consults. A patient who comes into one of New York-Presbyterian's 11 hospitals with a broken arm but also needs a psychiatric evaluation could sit in the emergency room for up to 24 hours if there's no psychiatrist available, Barchi said. But virtual visits can slash that wait time to just two hours. New York-Presbyterian also conducts virtual follow-up visits for patients with a number of conditions. Most follow-up care doesn't require a hands-on evaluation. So it doesn't make sense to have patients travel to the hospital for a 10-minute conversation, Barchi said. Mercy SafeWatch is the largest single-hub electonic intensive-care unit in the nation. Doctors and nurses monitor patients' vital signs and provide a second set of eyes to bedside caregivers in 30 ICUs across five states. The system also launched virtual ER visits for patients with non-life-threatening conditions through its NYP OnDemand platform. Instead of waiting to see an ER doctor face-to-face, patients can enter a private room and have a video visit with an ER physician who's sitting just 200 yards away in an office. It takes just half an hour, Barchi said. That same ER physician is also conducting urgent-care visits with patients sitting at home on the couch. To deliver on-demand care to patients at home, New York-Presbyterian partnered with American Well, one of the many direct-to-consumer telehealth companies now turning its sights on serving the needs of hospitals and health systems. But while leading health systems say on-demand care is a nice perk to offer busy patients, it does little to drive efficiency and bring down health costs. The direct-to-consumer platforms—including American Well, MDLive, Teladoc and Doctor on Demand—largely handle low-acuity conditions, such as skin rashes, headaches, coughs and colds. Some are starting to offer behavioral health services. But those aren't the high-dollar chronic diseases that drive hospital spending. Critics contend expanding low-acuity telehealth services could drive up costs. A March Health Affairs study by RAND Corp. found that although direct-to-consumer telehealth visits are cheaper than in-person care—they average about $40 to $50 a pop—the convenience factor encourages people to use more healthcare than they normally would. “The direct-to-consumer startups can do one thing and do it well,” said Nathaniel Lacktman, chairman of law firm Foley & Lardner's telemedicine industry team. They have done a good job of expanding access to low-acuity care. But health systems are well-positioned to use technology to care for “the sickest of the sick” who account for the greatest share of healthcare spending, he said. 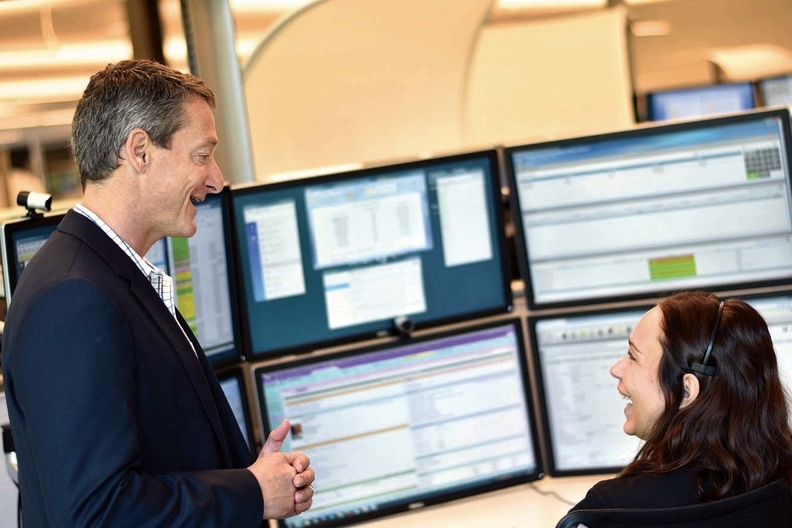 That's where there's an opportunity to drive real change in outcomes and true cost savings. The health system “that can crack that nut, so to speak, will be a game-changer,” Lacktman said. Dr. Gavin Helton, medical director of the Mercy Virtual Care Center's ambulatory medicine program, consults with a nurse. Mercy is changing the game with its $54 million Mercy Virtual Care Center. While the Chesterfield, Mo.-based system offers on-demand video visits, “we don't think it is going to change the health system and the care experience for people nearly enough,” said Dr. Randy Moore, president of the Virtual Care Center. Instead, Mercy focuses on monitoring and intervening on behalf of the sickest patients both at home and in the hospital. There are no beds or patients at the Virtual Care Center—just nurses, doctors and lots of IT staff sitting behind an array of monitors. Part of the center is devoted to Mercy SafeWatch, which is connected to more than 500 intensive-care unit beds across the Mercy system and several outside health systems. Clinicians use telehealth technology and data to monitor patients, order bedside care and follow-up. The results have been astounding, Mercy officials say. The length of stay decreased between 30% and 40%, and 1,000 people who were expected to die went home last year, Moore said. In another program, teams of trained clinicians at the Virtual Care Center monitor 4,000 beds for signs of sepsis, a leading cause of hospital deaths. Mercy also connects with patients recovering at home and is able to respond to their requests at any time. That's led to a 60% reduction in acute-care services and dramatically improved quality of life, Moore said. Low or no reimbursement for virtual care has long worked against telehealth adoption, but health systems that are capitated or involved in risk-based contracts aren't so worried about reimbursement. “We are already paid a fixed fee, so if we can bring our costs down (through our telehealth programs), and our length of stay while we improve outcomes, we can keep that margin to do other things within our mission,” Moore said. 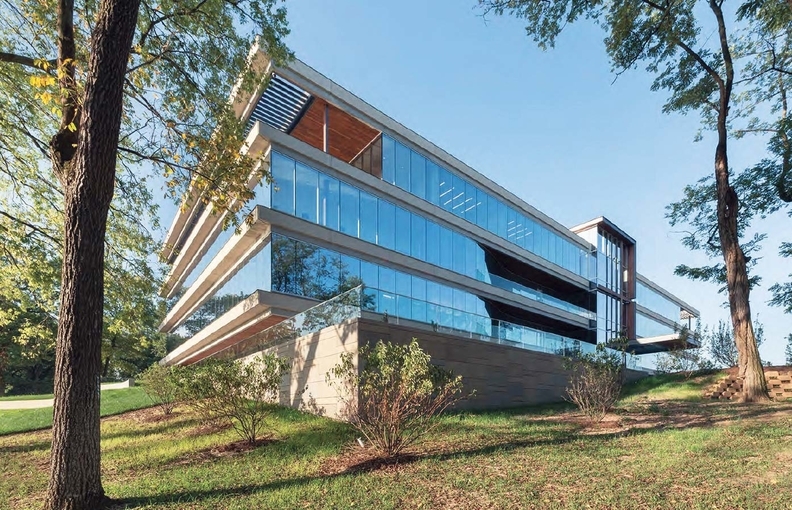 Mercy's four-story, 125,000-square-foot Virtual Care Center not only houses the nation's largest single-hub electronic ICU, but also provides a center for telemedicine innovation and a testing ground for new healthcare products and services. Many services are still paid for on a fee-for-service basis, however. Smaller providers interested in extending their reach through telehealth may have no way to enter a risk-based contract. For them, getting paid is important. Payment for telehealth services remains inconsistent and depends heavily on the payer, the state and the type of care. That deters some providers from taking the plunge, said Kofi Jones, principal and owner of consulting firm KJ Health Matters in Boston and former vice president of government affairs for American Well. Thirty-one states and the District of Columbia require private insurers to pay for telehealth visits. But the laws differ from state to state in what they cover. Medicaid programs in every state have some type of coverage for telehealth. But Medicare restricts payment to very narrow circumstances. For instance, patients must be outside of a metropolitan area and at a specific clinical site when receiving telehealth services. For now New York-Presbyterian is willing to take a loss for telehealth services if virtual care makes more sense than requiring a patient to come for an in-person visit. It's gambling that the service will eventually generate positive returns as the system moves into more risk-based contracting. “We want to use this to move into much more aggressive value-based contracts where we will be rewarded for keeping people healthy at a lower cost,” Mercy's Moore said.